San Elijo Lagoon CONSERVANCY is an ecological reserve that spans nearly 1000 acres in Southern California and is bordered by beautiful Solana Beach and San Diego’s coastal North County. In 1987 a group of volunteers established Your Conservancy to provide a unified voice for the San Elijo Lagoon Ecological Reserve. By 1993, this group was performing excavations to keep the lagoons access to the ocean open and free of sand and sediment. They also opened a naturalist guided education program in 1995 and developed a former leadership team in the 1990’s as well when Doug Gibson joined the team as the Executive Director and Principal Scientist in 1996. The second decade of the San Elijo lagoon CONSERVANCY brought the securement of endowments that enabled tidal flow to be supported by the California State Coastal Conservancy and brought much needed resources to the reserve. In 2,000 a generous grant from Ford Motor Company of over 1 million dollars secured the purchase of 33 acres of habitat expansion and set the stage for more expansion and preservation. Two years later, the President’s council was established in 2002 and many more fundraising goals were achieved by this group of 13 members. In 2007, the 20th anniversary of the conservancy, brought honorable awards for it’s notable leadership in both conservation and education. In 2009, two dozen scientists came together for a 24-hour period to identify 729 different species that were currently living in the reserve. The bioblitz was a first for North County. This decade also saw the formation of a formalized education program. From 2010 to the present the San Elijo Lagoon CONSERVANCY has opened public meetings to gain community input on San Elijo restoration projects, the Gateway property was purchased and renamed Harbaugh Seaside Trails and the reserve has been awarded several more times including the Water Wise Award for Citizens for Restoring Coastal Habitat Program in 2013. Permits were secured in late 2016 to expand and enhance San Elijo Lagoon under a strategic plan into 2020. The San Elijo Lagoon Ecological Reserve is a great place for anyone who enjoys the outdoor envirorment and coastal wetlands of San Diego including hikers, runners, bird watchers, photographers, equestrians, or those looking for solace. 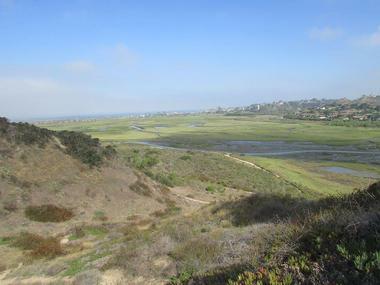 The trails at the San Elijo Lagoon Ecological Reserve connects many different coastal habitats from salt and fresh water marshes to coastal sage scrubs and beach strands. There are 979 acres to the reserve currently with more than 1,000 different species of plant and animal life that can be observed daily around the lagoon. Visitors should be aware that sometimes trails may be closed due to work to the highways systems on the North Coast Corridor that link the lagoon’s trails under the I-5 freeway. 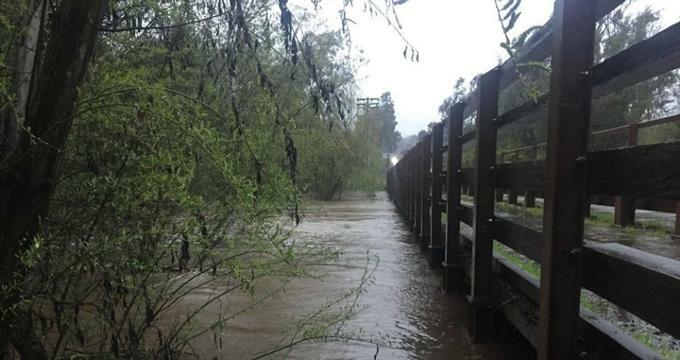 Some trails will also be closed during the San Elijo Lagoon Restoration Project that will begin in the fall of 2017 and continue through 2020. 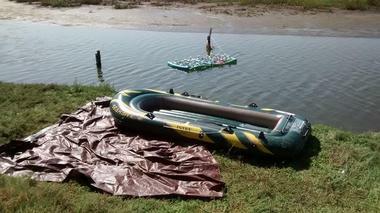 More details about this project and trail closures can be found on the San Elijo Lagoon CONSERVANCY website. Annie’s Canyon Trail- One of the more difficult trails at the reserve, Annie’s is open to visitors who can hike steep switchbacks that will take them through waving sandstone walls to amazing views of the Pacific Ocean in the canyon. The ¼ loop is rated moderate to strenuous and accessible from Solana Hills Trail and Rios Avenue Trail. The elevation is 200 feet above sea level. Dike Trail- Dike Trail is rated easy and perfect for bird watchers of all ages. During all seasons birds of different species and flowering plants can be spotted, included many rare and endangered varieties. This area has been a part of many early restoration efforts in the lagoon and received an Orchid Award for sensitive and endangered species restored nesting areas and habitats. Harbaugh Seaside Trails- This location is actually adjacent to San Elijo Lagoon and is a separate 3.4 acre open space park with amazing ocean views. The entrance is where Cardif-by-the-Sea and Solana Beach meet and is great for dog walking and sunset gazing ocean side. Bird watching is also exceptional from the seaside trails as Cooper’s Hawk and many other predatory birds are abundant here. This park is also an extension of the Coastal Rail Trail and was a gift from The George and Betty Harbaugh Charitable Foundation which gave $1.1 million towards the purchase of the land. Harbaugh Seaside Trails will be expanding soon to include a welcome area, viewing deck and trails. La Orilla Trail- Nature lovers enjoy walking this easy rated trail because they can stroll 3.5 miles through four different communities of plants. Begin on the east side of the San Elijo Lagoon Ecological Reserve where you can enter the head of the trail in the shady riparian woodlands. 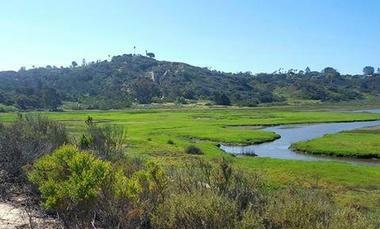 As you walk, jog or walk your dog, you will come upon marsh, chaparral, and coastal sage scrub. Many visitors will see deer at the creek beds, butterflies, wood peckers, and other small woodland creatures along the trails. N. Rios Trails- These trails are located on the south side of the lagoon and are rated easy. This collection of trails head off in several different directions all with a moderate descent into woodlands and coastal sage scrub. There are views of the salt marsh from the trail head and just east is a one mile loop known as Gemma Parks Interpretive Trail. Pole Road is located to the west of the trailhead where you can find Isthmus, the migratory bird watching station, or continue to the lagoon inlet where you can use binoculars to view the endangered Ridgeway’s Rail that nest here. Solana Hills Trail- This easy to moderate 1.4-mile trail has a steep descent that early morning runners enjoy. The trail is lined with beautiful wildflowers such as sage, everlasting, Monkeyflower, Yerba Santa, and gooseberry. The top of the trail provides views of the East Basin. A plant guide can be downloaded online that provides more information about the wildflowers that can be seen on the Solana Hills Botanical Loop of the trail. Santa Inez Trail- A quiet trail that is known for its abundance of wildflowers and grasses, the Santa Inez Trail is connected to the Dike Trail and is rated easy. Santa Carina Trail- Less than a mile long and rated easy, the Santa Carina Trail traverses coastal sage brush on the south side of the Lagoon where visitors can view the freshwater marsh and chaparral communities. Santa Helena Trail- just over a mile long, the Santa Helena Trail is an easy trail that runs through coastal sage brush and connects to the Stonebridge Mesa Trail to take hikers to the East Basin. The Stonebridge Mesa Trail is only open April through November due to winter flooding. 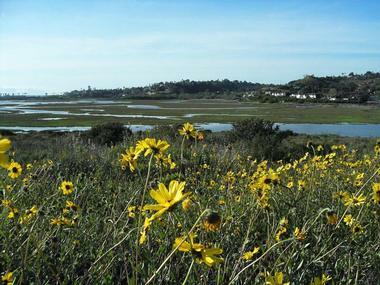 The San Elijo Lagoon Nature Center serves as the visitor’s center for the San Elijo Lagoon Ecological Reserve. This two-story center offers an outdoor observation deck on the second floor with views fo the San Elijo Lagoon. The museum inside features interactive exhibits covering the history and ecology of the lagoon. Visitors can meet animals up close and personal and access the Nature Center Loop Trail from here. The Nature Center is also Platinum-certified Green and provides visitors with real life glimpses into how green technology works. Some of the technology that patrons will see include solar panels, irrigated roof plants, recycled water used in landscaping, and now the building itself is made from recycled materials. The Nature Center is open daily from 9am-5pm. Guided Tours are offered on Saturdays from 10-11 am except for every second Saturday of the month. The Nature Center is always free admission and free parking with Family Fun Days being offering every First Sunday with themed explorations that the entire family can enjoy together. You can also rent the Nature Center for private events such as birthday parties, luncheons, meetings, or weddings. San Elijo Lagoon Conservancy is involved in several conservation efforts that can be observed at the San Elijo Ecological Reserve. The plant nursery, Sowing Native Seeds is a low impact nursery located near the Santa Inez trail head. Lagoon Platoon is team of volunteers working to revilatize the lagoon through hands on conservation efforts that are led by biologists. Volunteers are also always needed to verify bird counts on teams that meet monthly. Staff at the conservancy also work with San Diego Parks and Recreation on restoring habitats, controlling invasive plants species, tidal circulation, land stewardship, water monitoring which happens weekly at 6 different sites at the Lagoon, and other ecological projects. The Conservancy website provides multiple downloadable resources for teachers who plan on using the San Elijo Lagoon Ecological Reserve to teach environmental science. The conservation education program is aimed at providing students with a way to connect with nature and learn about the watershed and wetland environments. Resource are available for grades k-8 as well as a conservation project guide.